AMSTERDAM, Netherlands -- The five countries investigating last year's shooting down of a Malaysia Airlines plane over Ukraine are calling for an international tribunal established by the United Nations to prosecute those responsible. 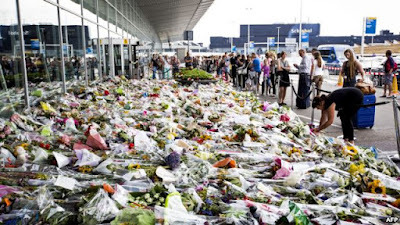 Bouquets of flowers in tribute to the victims of the downed Malaysia Airlines flight MH17 on July 25, 2014, at Schiphol airport near Amsterdam. Malaysia's UN Ambassador Ramlan Bin Ibrahim said on June 25 that proponents hope to take up a draft resolution in the UN Security Council in July, saying, "We can only hope for the best." Last week, legal experts presented the Security Council with a draft statute to establish a tribunal along with a draft UN resolution that would authorize it, diplomats said. Malaysia, home to the airline whose plane was shot down, and The Netherlands, where most of the 298 travelers who were killed resided, originally espoused the idea, and the rest of the countries -- Australia, Ukraine, and Belgium -- gave their endorsement this week. Australia's Foreign Minister Julie Bishop said her government is committed to working with "the broader international community to secure justice for the families of the victims." Ukraine and the West suspect Flight MH17 was destroyed by a Russian surface-to-air missile fired by Russian forces or separatist rebels fighting in the area. The Russian maker of the Buk air-defense missile system reported this month that the aircraft was downed by an older version of the missile that it said is not used by the Russian military but is in Ukrainian arsenals. Dutch prosecutors, who are leading the investigation, have narrowed their focus to the theory that the plane was shot down by a Buk missile fired from an area held by pro-Russian forces. They believe the missile was transported from Russian territory shortly before the incident. That raises the possibility that Russian nationals could be named in their indictment. But the chance of a successful prosecution is considered slim at best, Dutch sources said. A trial in Ukraine itself appears a nonstarter, since the pro-Russian rebels are as unlikely to attend as the Russian government, which influences them but strenuously denies involvement in the incident or the rebellion. The hope is that by pushing for a UN-backed court, countries representing the victims could pressure Russia into cooperating. The Kremlin recently declined to comment on the tribunal proposal. The countries representing victims acknowledge that Russia might wield its veto power over Security Council decisions to kill the idea. But they argue that Russia would be reluctant to exercise that veto power, since that would make it the main obstacle to justice in a mass killing of civilians. Moreover, the Security Council already has adopted a resolution demanding that the perpetrators be brought to justice. Malaysia has had preliminary discussions with Russia, Ibrahim said, "but it's too early to say" whether Moscow will support a resolution. Dutch Foreign Minister Bert Koenders met his Russian counterpart, Sergei Lavrov, on June 6 for talks about the criminal investigation, but no word came out of that meeting.